A summer glow is beginning to shine upon many tempting destinations in May. Let the Mediterranean warmth lure you in! Those 25°C temperatures are tough to resist. Create your unforgettable villa holiday and plan an adventure full of discovery. Or perhaps you fancy time spent rejuvenating by your private pool? We've handpicked some of our top villa holiday destinations in May - offering enviable climes, natural beauty and rich culture. There's something for everyone in Sicily, Malta and the truly Spanish Andalucia. Dive in and uncover your idyllic May villa holiday. 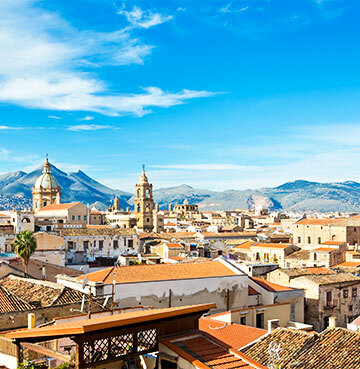 A true Italian heartbeat flows throughout Sicily, the largest island in the Mediterranean. Treasured archaeological ruins leave you in awe, overlooked by the striking Mount Etna. Take in views of secluded coves scattered with rugged lines of housing. Sicily lures visitors year after year and it’s easy to see why. It consistently enjoys warm temperatures, with May sitting at a delightful 24°C on average. Spanish, Italian, Greek and Arabic influences shine through in the city of Palermo. Baroque palaces are dotted throughout the centre, setting an atmospheric scene full of history and tradition. Here, intertwine through the streets and meet the locals in nearby traditional markets. Historical stories live within the streets and walls of old Norman Conquest buildings. Italy of the past is present before your eyes! Sicily will dazzle and excite all of your senses. In the north west, the charming Scopello glows with beautiful surroundings which were once the setting of the film Oceans Twelve. The Greek temples of Agrigento, Selinunte and Segesta can be viewed during day trips, taking you back in time. 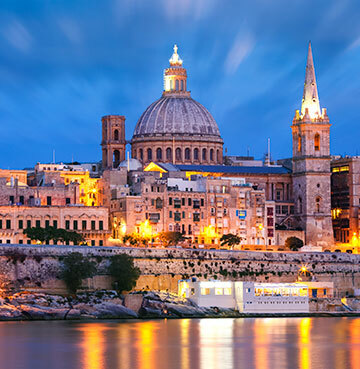 Colourful and tantalising, Malta is a small island with a lively personality. Sitting proudly in the Mediterranean, it boasts quirky towns, picturesque harbours and hidden sandy inlets. With temperatures reaching up to 23°C in May, it makes for a wonderful villa holiday of discovery and relaxation. The capital of Valletta attracts visitors with its charming glow from traditional buildings and impressive Grand Harbour. The bright cobbled streets are strewn with local boutiques and unique cafés, giving you the opportunity to taste authentic Maltese delights. Visit famous Baroque palaces and admire classic cathedrals with striking designs. On the nearby Comino Island, the Blue Lagoon is a sight to behold. This beautiful bay is a picture-perfect vision of calm turquoise waters lapping against the rocky shore. Here, unwind in pure serenity with beautiful landscapes creating an unbeatable backdrop to your day out. Your villa is an inviting secluded space making your May holiday a treasured one. 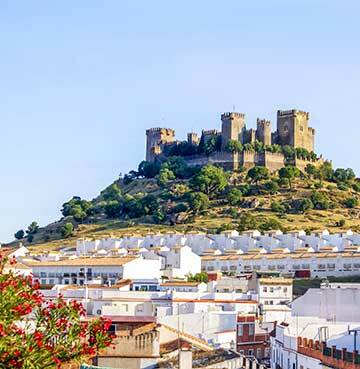 Andalucia is quintessential Spain at its finest. Picture a scene of lazy siestas, fiery flamenco and tempting golden beaches met by classic castles and Moorish buildings. You'll sense the rich history existing throughout, influenced by the Moors which ruled the area for 800 years during the middle ages. The UNESCO World Heritage Sites of the Alhambra and Mezquita stem from this era, and their walls are oozing with Spanish tradition and culture. This vast region is home to many green hills and rural farmland, rolling towards splendid coastline. In May, temperatures sit at a balmy 25°C, with sunlight hours growing as summer creeps closer. This creates a charming atmosphere for a memorable villa holiday packed with cultural discoveries and blissful relaxation. Sample local Spanish delicacies with a Moorish influence. And, believe us, these really are irresistibly moreish! With over 80 modern and charismatic villas in the area to tempt you, Andalucia is a delightful setting for your May holiday. Whether you choose the enticing village of Frigiliana or the beautifully mountainous Nerja, you're bound to fall in love here! Immerse yourself in the laidback, colourful and typically Spanish vibes present within this alluring region. If a May getaway's not for you, maybe an April villa holiday can tempt you? Or why not wait another month and head off for an amazing June villa holiday?